A public party on the summit of the Puy de Dôme (Auvergne-Rhône-Alpes) will take place this September in celebration of the site finally being granted Unesco World Heritage status this week. On Monday (July 2), the volcanic ridge in the Auvergne - the Chaîne des Puys - was finally awarded official Unesco status at the 42nd annual Committee meeting, after 11 years of work towards the title. 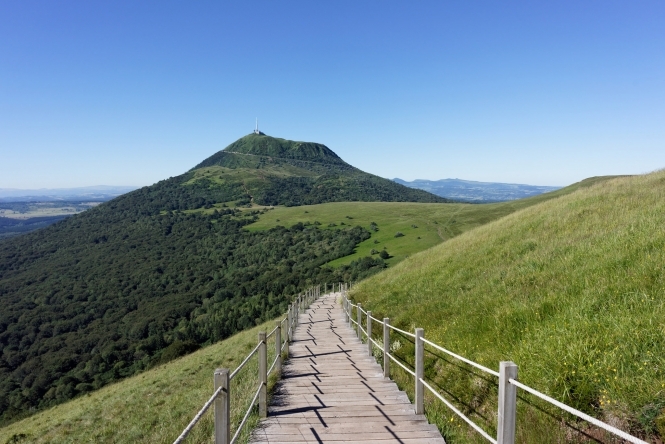 Now, a party on the summit of the Puy de Dôme dormant volcano - sometimes called the “pearl” of the Chaîne des Puys - will take place on September 15 and 16, with ministers and other relevant officials invited to the celebration, as well as local residents. Ministers and many others who have been instrumental in campaigning for the Unesco listing are also set to have their own celebration this Friday (July 6), including Mr Gouttebel; and Eric Gold, senator and departmental councillor in charge of the campaign. Ségolène Royal, former minister for ecology, sustainable development and energy, is also expected to attend, while the current ecology minister, Sébastien Lecornu, has already confirmed his attendance via Twitter. ⛰La @chainedespuys classée au patrimoine mondial de l'@UNESCO. Une 1ère en France métropolitaine pour un bien naturel ! As well as the forthcoming parties, Puy-de-Dôme is also planning a series of celebratory events throughout the year, and is already thinking about how to celebrate the one-year anniversary of the honour in 2019. After more than a decade of work to promote the candidature of the region’s volcanoes as a Unesco World Heritage Site, the area finally received the accolade this week. Previous bids for the title in 2014 and 2016 had been rejected, but this year the Committee in Bahrain unanimously approved the bid in less than 15 minutes of discussion. Reaching 1,465 metres, the Puy de Dôme is not the tallest peak in the Auvergne, but it is one of the most cherished and celebrated in the ‎Chaîne des Puys mountain range. Although a formerly volcanic mountain range, the last eruption in the area was 10,700 years ago. Now, the peak and surrounding mountains are known as a popular hiking and paragliding destination for tourists, attracting over 500,000 visitors per year. An electric railway with expansive views of the countryside operates regularly to take people to the peak, but due to recent sustainability campaigns, camping on the site is no longer permitted, and cycling is limited. Further initiatives are now expected to maintain the beauty and heritage of the area while also allowing more tourists to visit and celebrate in the new Unesco status.